First of all, you can find trash bin button in the bottom right corner of every thumbnail. You can also find it on the left side panel when you open the asset. Finally, you can find trash bin button at the top of the Infopanel once you open the file. To delete multiple files in one click, you should first select them. After that, you can either hit the trash bin icon on the left side panel or press “(i)” button in the right upper corner of the screen to open the Infopanel. Please note that Move to Trash button doesn’t delete your files beyond retrieval. In fact, it just moves them to Google Drive trash folder. After you pressed it, you will find a blue restore button in the middle of the faded thumbnail, which if pressed will bring the files back to life in one click. Also, you may delete the whole collection at once. Just mouse over the collection you want to remove and click on the "Delete collection" button. NB Deleting assets from your Lightboards has some peculiarities. Learn more about it in the corresponding article. What if I want to keep an asset in one collection and remove it from another? Please note that when you delete an asset from Pics.io, it is removed from all collections and lightboards it is attached. Sometimes, however, you want to remove your asset from one particular collection or lightboard, but keep in other places. To do so, you just need to detach this asset from this collection or lightboard. Open your asset and find Collections/Lightboards section in the Infopanel. Choose a collection/lightboard you want to detach and click on the cross next to its name. That will delete this asset from this particular collection/lightboard, but save it in the others. Is it possible to restore deleted assets/collections? If you accidentally removed assets/collections from your Pics.io account by clicking on Trash bin icon next to an asset/collection, it is still possible to restore the deleted files. 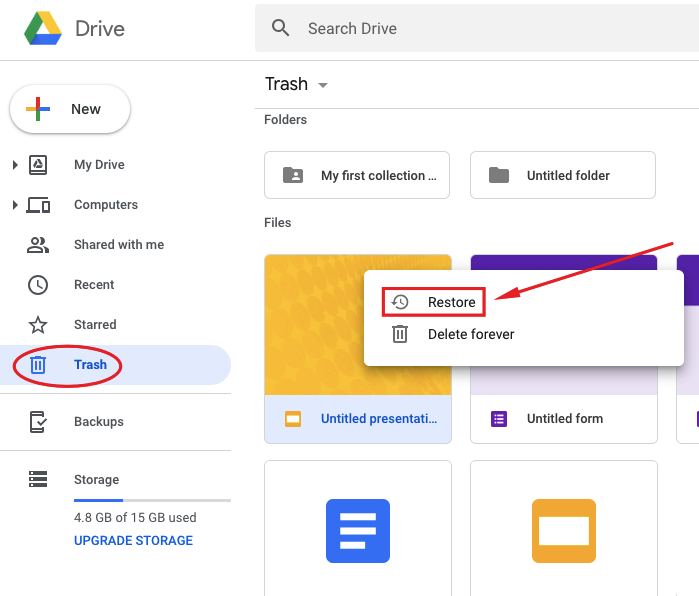 To do so, just log into your Google Drive connected to Pics.io -> go to the 'Trash' folder on the left side menu -> select the asset/collection you want to restore -> make a right click on the file -> and choose 'Restore'. After that, you need to make sync from Google Drive to Pics.io: go to your Pics.io account -> mouse over the 'Settings' button in the top right corner - > click on 'Sync'. Once sync is completed, the removed assets/collections should re-appear in your Pics.io library.